Mapping Aran Irish: A 25-Year Job! Over 25 years ago, the Dublin Institute of Advanced Studies asked me to document the spoken Irish of Inis Mór in the Aran Islands. No serious study of Inis Mór Irish had been done there since the Danish scholar Holger Pedersen and the German scholar Franz Nikolaus Finck had investigated the dialect in the years 1894-1895, nearly 100 years before. Since my father’s parents both came from Inis Mór, I was a logical choice for the work. In a way, though, I was an odd choice. I was a Californian whose previous field experience in linguistics was a sociolinguistic study of the spread of the Swahili language in western Kenya. When I began my work, I knew that the dialect of Irish on Inis Mór and on Inis Meáin was very similar to the dialect of Irish spoken in the Cois Fharraige area on the Connemara mainland. I also knew that the Irish spoken on Inis Oírr was quite different, with traits that tied the dialect to the Irish spoken in eastern mainland areas – in the Burren and even in distant Kinvara. I thought that my work would be simple, that I might discover a half-dozen differences in speech that might distinguish the Irish of the west end of Inis Mór from the Irish of the east end. Then I would discover a few more speech differences that would distinguish the Irish of Inis Meáin and of Inis Oírr. I soon discovered, however, that on Inis Mór itself, the speech differences were far complex than I would ever have believed. Even little groups of townlands on Inis Mór could be distinguished from each other by their speech. The island could be divided into three or four subdialect areas separating the townlands on an island hardly 9 miles long! And of course there were other speech differences separating the other two islands from one another. Still, I thought that I could sort out all these complex differences with three or four years of hard work. As it turned out, the work occupied 25 years of my life! The result is a 1,000 page research work on the speech differences in the Irish of all three islands, with special attention given to Inis Mór. A PDF of this work can be downloaded at no charge from the website http://aranirish.nuigalway.ie/en/. In addition to the downloadable PDF, you will find three pages with links at the website which will summarize the most important points about this research work. Accompanying this website is the Facebook page www.facebook.com/aranislandsirish/. And for yet more information relating to the rich history and culture of the Aran Islands, be sure to visit the bilingual website www.aransongs.blogspot.ie. Séamas Ó Direáin / James Duran, Ph.D. It will pass as it always did and it always will be. The only thing is that one can never be sure about the moment “when”. Of course with the up to date technology a lot of movements is possible to check beforehand but still. Since last night there is no ferry and no plane. This does not only mean that travelling is not possible but also that there is no post and either goods or provisions can be delivered. The shop runs therefore empty. In the early morning I spotted a tractor coming along but for the rest of daylight I did not see a soul. The road was and is still quiet. This in contrast with the ongoing tumult of noise, caused by the storms competing with one another about the championship. Sometimes the sound is nearby, pushing and pulling on everything she is trying to get hold of. Other times it sounds like yelling and screaming. In a situation like this when the wind has a superior role in the overall scene the question pops up what the wind does when she doesn’t blow. I find it hard to exclude myself from it all the more because there is an ongoing stream of rain lashing against the window too which adds to the various sounds. Up till later in the day there is not any need or urge to go outside but when I actually did go out to close the church it was hard to keep standing on both my feet as the wind tried to blow me away. The colour of the sea and the sky now is alike: grey. Not as dark though as the stonewalls which have the look of shining bronze, at this moment, but compared with the impelled waves getting a bright white colouring, it looks grey. The only thing I know for sure is that rain will cease and storms will ease. Wished I could frame them in. . .
On the wire that early morning not just one but, if I counted well, seventy or even more of them were there. Side by side, completely immersed in toileting themselves for the day to come. Then, all of a sudden, breaking through the serenity of the moment, there was the sound of rustling and swishing and off they went to far horizons, scooping down and up again as one long and broad garland driven by a whirl of wind. Since the stranger birds left for warmer regions to hibernate, the domestic ones apparently took over their position. Now it is them to be the bean an tí (landlady) and with the temporarily change they look more valiant than ever before. Like the other day when I saw six of the slightly bigger ones on top of the church. My conviction that the seagulls had a booked place over there was negated by what I noticed now: on both crosses of the nave of the church the stayers retreated. Not as I was used to in watching the seagulls: just one on the top. What I noticed was that each of the three ends of the two ornaments was occupied by them. Well, I am not sure whether the birds seemed completely at ease but still, in any case they were courageous. Another day, another pair. Even another colour. The same size though. Nearly every morning around the same time I lay down a different pair on the brown polished shelf. Pure pleasure it is for me to give them their nicely tugged in place. It is between the small but sturdy wooden tractor for the small children to play with and the freshly spun wool with its’ specific smell of lanoline from the sheep of Inis Meáin. In full brightness they shine towards me. Their lively and bright colour attract straight away of course but there is more. Is it perhaps the material itself with her touch of softness; is it the way it is made? What is it? It was during the summer, not long after the cuckoo had left the island, that she was sitting on the stone wall in front of her house. Obviously she was waiting for me to pass for when we greeted one another and had enjoyed a little chat she asked me whether I would like to present them to the visitors. “Of course, I said, I feel it as an honour if I can do you this favour”. And so we decided. The next day a coloured bag was already waiting for me. It is the sharing of a vital part of how she has spent all her life up till the present day. Although the colours might have been changed in the cause of the years the reason “why” will not have been changed. It is her generousness in full brightness which shines towards us. In fact it was only just a tiny little scrap out of your entire life time on the island that I got to know you. For it was here on Inis Meáin that you were born and bred. Amongst your family, your brothers and sisters and all those living around you grew up. With a good lot of them you walked for many a year the tiny and sheltered roads for going to school. With them too you probably played on the slabs of limestone, looking out for the little ferns growing in the narrow grykes. In your garraí (potato field) it was I first met you when you were preparing the wide ridges and deep ditches. You generously allowed me using a strip of them for growing some vegetables. Sometime later you showed me how you restored the gate of a stonewall. It was thrilling to see how deeply you were connected to the stones; out of the heap you just knew and blindly you picked the one you needed. Not long before you left the island you gave me your last advice for which I am still up to this day very grateful to you; “Tigh Cháit will be a lovely place for you to give out cups of tea”, you said. While standing at your grave I even sensed your smile, fully content you seemed. And you were so right, I think. Really everything was prepared for you so well. On the soil freed from the acquired hole various spades had been laid down. At both sides of the dug grave the grass was neatly cut on three sides which was nicely wrapped up in a roll afterwards. After the coffin was lowered into the hole and the first padríní (prayers) had been spoken the priest spread the first heap of soil over the grave. Your family and friends took a spade then and filled up the left space with care. Whereupon the carefully laid aside wrapped rolls of grass were put back on top. I will miss you but I am sure for you this is home coming. In Germany, when I sleep in my highrise apartment in the city centre, I dream of Inis Mór. She comes to me in the mind’s eye, approaching me over the horizon, as if I am skimming the Atlantic ocean in flight. She looms before me in Galway bay, the sea foam exploding on her southern flank, while the white boats glide softly towards her northern. I smell the milky seaweed, encrusted with salt. I hear the nickering of the horses, the clatter of their hooves. I feel already the harsh karst under my feet, land that has stood, sentinel like and unyielding, for thousands of years. I see the eyes of the old fishermen, swaddled in their sea2beaten faces, eyes that have stared so long over blue waters that they seem to echo the ocean. I dream this, and there, I am returned; an Oisín that has touched the mortal soil, but yet raves of Tír na nÓg. Four glorious months flew past me in Inis Mór, barely stopping for breath. For those four months, I was lucky enough to call Inis Mór my temporary home. I lived there. I breathed there. I became there. The precious hours strung themselves like beads on the short thread of the summer. I rose early, watching the first ferries drifting into the sound, the foam in their wake immediately evaporating. The sun rolled across the sky. I chased the wind down Eochaill hill atop a cranky old bicycle that grumbled if I changed gears with too much ambition. Then, I launched into work in the local supermarket, where I was greeted with smiles, chatter, gossip, and friendliness from the very second that I arrived there. The tourists spilled in, a tide of enthusiastic travellers that brought stories from all corners of the globe. Those moments, how I gathered them up and hid them inside my soul, like a greedy child stuffing their pockets with marbles. Then, when the work day ended, my hands stained with newsprint, it was a slow trudge uphill and homeward. My breath came harder as I crested each little hill, the evening painting more of the sky as I climbed. Symphonies of red, purple, yellow and orange lashed across the horizon as I defeated the final summit and cruised home to rest, leaving an Elysian canvas in my wake. My European friends scarcely believe me when I talk about this place. It’s like something out of a storybook, they say. To them, such a place is impossible. The stories of Inis Mór enthrall them. The night before my friend and workmate Gareth left the island for good, we trekked up to the highest point of the island, Dún Árainn, and lay down on the grass, stargazing and putting the world to rest. The night was silent, the stars blazed with ferocity, and we could see the glow of fireworks bursting into life across the ocean in Connemara. Laying on our backs there on the highest point of the island, our faces turned to the universe, the sea exploding against our island only a kilometer away, exposed before the heavens, we could almost breathe in infinity. And as if to prove it, shooting stars flitted across the sky. Or the stories of my friend José and I, and the many nights we spent slurping hot cups of tea while we lounged on the back wall of the house, the sun wandering below the horizon and the stars beginning to yawn. He taught me Spanish words while the moon rose over the bay and the moths stirred in the grass below. One night, a red moon drifted above the bay, softening out into lemon yellow and then sharpening to white again, before the cold Atlantic air nipped at our faces and ushered us back indoors. Here, the stars and moon shrink from the glare of this city of a half a million people. The air smells of rich European flowers, not of the seaweed and the salt lace trim of the island. The roads run thick with traffic, trams, cyclists, pedestrians, and anonymity. Cities turn away from you. To the great metropolises of the world, you are nothing more than a solitary enzyme in their system, an ant meandering through its caverns. Anonymity rests on my shoulders here, dragging behind me on the ground like a cloak. No such anonymity existed on Inis Mór. Everyone knew my name and my hometown within a week. Cars pulled up beside me on the road, windows rolled down, and lifts up the hill were offered, stamped with that islander smile (special thanks here must go to Fionnuala and Cyril, who gave me more trips up the Eochaill hill than I can count). Greetings, waves, and handshakes were the order of the day, pints and glasses of wine were generously passed around, glassware clinked together and the laughter echoed across the sound. We raced up the hill in the back on Philip’s car, Ráidió na Gaeltachta blaring out a jig from 1986, and we roared with laughter and wondered how this one summer could ever end. The All Ireland Final was an interesting one that year. Donegal versus Kerry; green and gold, versus green and gold; and most importantly, me versus Paul, my good friend, workmate, and proud Killarney man. The healthy tension was spurred on by the islanders, who made Donegal versus Kerry jokes for two weeks before the match every time they saw us. We both scrambled for the day off work, and got it, and so it was to the front lines of the pub we went, washing down cheese toasties with beer, holding our breath, gasping… and, eventually, in my case, bemoaning our defeat. We celebrated and commiserated in our usual fashion with a bottle of red merlot (which has since become my drink of choice, thanks to Paul today, neither my health nor my dignity thank him, but I do). A kaleidoscope of memories wheels behind my eyes as I write this. How can I possibly describe everything and everyone who made an impact on me on that island? How could I tell you about the scratch card contests between Mary Burke and Roland outside the café, and how they raced each other inside to the till to cash them? How can I ever do justice to the oceanic spray of Dún Dúchathair, flaring over the black cliffs like a bridal veil? How can I describe the feeling of cycling up the hill in pitch blackness, feeling my way forward by the twin lights of my bicycle lamp and the lighthouse on Oileán na Tuí? How can I put onto paper the lump in my throat when Angela plonked an Irish breakfast (on the house) in front of me on my last morning? How can I put into words the love I have for these people, the embraces I shared, the gifts they gave me, the memories I carry with me? Does it even make sense, any of this? How can I ever thank all of them for this… this thing that has been planted within me, this thing that no words in neither Irish nor English can ever describe, this thing that I carry with me, yes, I carry it in my heart, and I know not what it is, but I know that it feels of karst, it smells of seaspray, and when I look at it, it is the sun sliding down beneath Galway Bay, hardly willing to let Inis Mór out of its sight, and I’m watching from Dún Árainn as I always did, the boats are drifting across the sound like spirits, and the air there is so still that I can hear the céilí music, faint as a dream at the point of wakening, flitting between the stone walls of Aran. I called up to a friend of mine, called Niall some time ago and I could only say that Niall really is a man of Aran — he is a first class fisherman, a champion oarsman, a builder of walls or indeed anything, he is a tremendous father and husband and I know he’d agree with me when I say that one of his best ever decisions was in marrying the lovely Genie, who could only be described as ; as beautiful on the inside as she is on the outside. Over the last 15 or 16 years since I’ve been separated, for one reason or another, I haven’t been able to make a “go” of any relationship. Anyway, I have had many the supportive conversation whereby it’s been pointed out that I just haven’t met the “one” yet and one of these days, she’ll step off the boat and ill know when I know. What’s meant for you, won’t pass you by or some such thing. Well, I burst out laughing and in fairness, as her declaration is possibly for others to judge but once again I found myself feeling blessed to be living in a small community with real friends who will call it as they see it. I left their house , no wiser but alot happier after the candor and a good belly laugh. These things only ever seem to happen to me on my beloved Island. At the very heart of this unique and beautiful island is community and the essence of community, is family. There are three Aran Islands and the smallest – the little sister of Aran – is Inis Oírr (pronounced Inish Sheer). The name means “island of the east” and it is the most easterly of the three. It is not as popular as the largest island, Inis Mor – but if you love mystery, you’ll love Inis Oírr. It has the expected Irish cottage-style houses, endless stone walls winding around the landscape, fishing boats, and beautiful Celtic crosses in the cemetery. But this little island with just 300 inhabitants also has a castle ruin, a shipwreck, a Bronze Age tomb, a holy well, a beautiful beach and an old church ruin that sits 6 feet below the ground – a result of the Atlantic winds burying it with sand. Much like the Burren, Inis Oírr is solid rock. For thousands of years Islanders spread seaweed and sand over the rock to cultivate a little patch of green where potatoes could grow and cattle could graze. The soil on Inis Oírr is seldom thicker than a few inches in any one place. Islanders picked up the rocks that covered the ground and piled them up to make stone walls. These eventually became enclosures for cattle. If you lined up all the stone walls on the islands in a linear direction, they would cross the entire country. It’s a magnificent, windswept, damp, wild, rocky landscape. The primary economy is seafood. It’s a very similar lifestyle to the offshore islands in Maryland. The families earn their incomes through harvesting seafood and tourism, with a little bit of “side-work” thrown in hear and there. Cooperative groups handle things that generally affect all the islanders like how to manage debris and garbage, keep the beach and roads up and settle issues that affect the entire island. But the landscape is the polar opposite of our Maryland islands. Instead of rich swampy marshes and mud there is rock and rock and more rock. Instead of sweltering heat and humidity you can slice with a fishing rod, the Aran Islands have a temperate climate that is not too hot in the summer and not too cold in the winter. There’s a beautiful beach on the island with water the shade of green I remember seeing in the Caribbean. The beach has a wide sandy area, but also has remnants of boats lying about that have all seen better days. Curraghs, a type of island row boat, are all over the island. The islanders use curraghs for fishing. They were first built with timbers covered with animal skins. Now they’re much more durable, usually made of fiberglass. A fisherman told me that the front of the curragh is slightly elevated and the bottoms of are curved or rounded. This is so the boat can cut through wave head on and and roll over the waves when the hit from the side. Three men can fish from one curragh. I wanted to visit Inis Oírr because of the legend of St. Gobnait. This island was where Gobnait received her vision to go to the place where she’d find nine white deer grazing. That would be her place of resurrection. That is where she’ll be safe. That is where her spirit will be most alive. Finding one’s Place of Resurrection is an integral part of the thin places concept. Gobnait saw the nine white deer in Ballyvourney in West Cork. She founded a monastic community there that flourished, and she became the patron saint of Ballyvourney and is beloved by all the people in Cork. Her holy well there is a huge pilgrimage site. There’s stunning little church ruin presently on the spot where St. Gobnaits had her vision there on Inis Oírr, The church dates back to the 8th and 9th century structure still stands on the Island next to the remains of a beehive hut. According to the legend, it was in or near this place that she had her vision. I also knew that there was a holy well on the island. So these were the two things I wanted to see the most. Me: I was really looking for a minibus tour. Young man: Oh, there are no buses. What ya need a bus for. It’s a great day. Me: There are no buses? Young man: There are buses. Young man: $50 euros for the three of you. Me: Do you have a site related to St. Gobnait? Young man: Uhh.. yes. There’s a church. Me: How about dolmens, standing stones, sacred sites. Young man: No dolmens, no stones. We have a church… yeah. And a saint. Me: You have a saint? Young man: St. Kevin. C’mon hop in, we’re losing time. He was an excellent guide, had a great sense of humor and I felt I’d certainly got my money’s worth. But he knew little about thin places or the concept of mystical landscapes. He knew nothing about St. Gobnait except that she was from Cork. But he knew much about the castle, shipwreck, lake and history of the island. His name was Aidan. I would highly recommend him if you’re ever on the island. 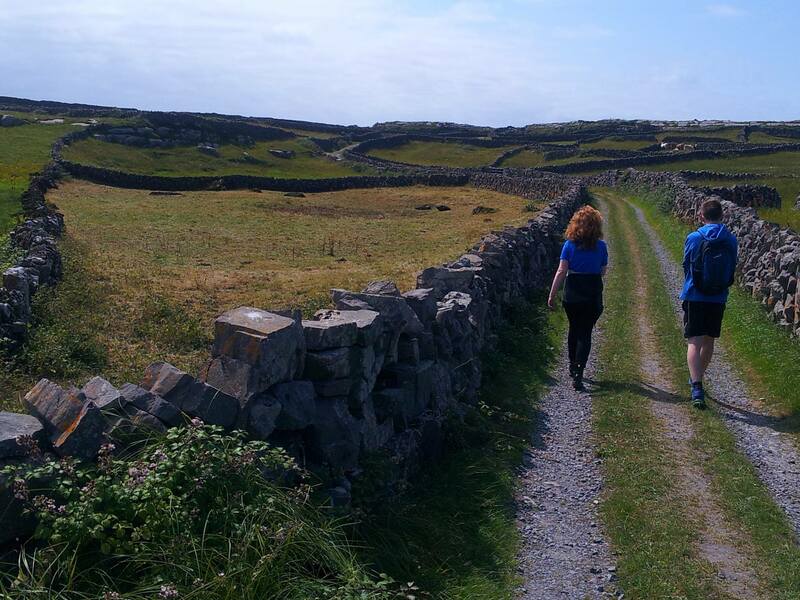 Though Aidan gave a fantastic tour, I was a little disappointed that there seemed to be less identified mystical places – and not an apparent great love for them that I found in the islanders on Inis Mor. The first stop was a Bronze Age tomb. This was uncovered by a storms gradually blowing the sand off until it was eventually visible on the surface of the land in 1885. You can see that the two standing stones mark the grave and the slight stone wall is where the islanders uncovered human remains along with Bronze Age treasures tucked in with the bones. The whole thing is set atop a huge mound similar to the style of tombs seen in Lough Crew and the Boyne Valley. Just beyond the tomb is the old rusty relic known as the Plassy Wreck. The ship ran aground in a storm in 1960. All the crew were saved but the ship was abandoned. Eventually, it was cast up on the rocks and has been sitting there since. The church of St. Kevin is buried in the earth, and one must climb down into the ground to get to it. It dates back to the 10 and 14th centuries, but it was continually covered with sand and had to be dug out regularly. Another islander told me they deliberately built the church in a “dug-in” style to protect it from the elements. I’m no scholar, no I make no assessments, but I’ll enjoy learning more about this special place. The church still has its altar in tact and above it is a beautiful stone carving of Christ. There are cut-outs in the stone where pilgrims will place devotional candles and stones as tokens of devotion. St. Kevin (of Inis Oírr) is buried beneath an oratory just next to the church. The island graveyard fills in the grounds around the church. Visible from almost every perspective on the island is O’Brien’s Castle. The ruins date back to when the O’Briens owned the island. The castle is three stories high and was eventually razed by Cromwellian types in the 17th century. It’s ruins haunt the island skyline. Finally, Aidan took us to St. Gobnait’s church (pictured earlier in this post). This is much smaller than Kevin’s church and is much more remote and unkempt. The roofless structure dates to the 8th century and close by are the remains of a cloghan or beehive hut. I stopped for a minute and remembered Gobnait. I thought of what it must have been like to be fleeing in fear, a single woman. Then to have this vision about how to blindly navigate this unfriendly, wild landscape to a place where an invisible presence is leading you, a place where you will not only be safe, but you will belong. A place you’ll know when you get there. That’s some serious trust. I jumped in the carriage and had one of the most meaningful tours I’ve ever had in Ireland. The man’s name was Stiofán (Stephen in Irish). He was quiet but ready to share all he could about the island way of life. I soaked it up. He didn’t seem the religious sort, and I thought it strange that he asked only if I wanted to visit the well. He didn’t mention the other sites along this side of the island – like the seals, or the fisherman’s working areas … nothing but the holy well. Then Stiofán surprised me. He got down on his knees and scooped water from the well with his hand to bless himself three times. The well meant something to him after all. I was humbled. Really … humbled is the only word I can think of. There was a gentle holiness about this man, and it revealed itself to me there at St. Enda’s well. What an encounter. I kinda figure he should have seen the eel. I will take a group back to Inis Oírr someday, and we’ll visit St.Enda’s well. I hope we’re lucky enough to have Stiofán lead us there. He’s a rare one. If you get to Inis Oírr before me … ask for Stiofán. And ask him to show you the holy well. It was quiet that same evening when I went over for closing. The sun had already set. Nice colours marked the sky and there was no wind of any importance. The birds had probably found their shelter for the night yet at least I did not hear any tone of them. The only animal I did see was the cow near Dún Chonchúir, she looked at me without actually looking. I suppose I distracted her out of her atmosphere of the night. As I used to do when I enter in the evening, I first had a look inside if someone was still in. Then I blocked the door and went through. Only a few candles were still lightened but those gave everything around the altar an intensified and intimate glance. I saw lovely bunches of flowers everywhere around as well as on a small table in the front on which a lovely embroidered cloth was laid. In addition there was a booklet called An Chéad Chomaoineach (the First Communion) with a picture of the children attending the school, the receiving child to be, inclusive. Between the first benches there was the covered harp and the music. Everything looked tenderly looked after. I extinguished the candles and left. When I returned the following morning and lit the candles again I heard an ongoing chirping. It was only when I unlocked the door that the bird which seemed to be so eager to be in the oncoming festivity, emerged. How did you begin writing? Did you intend to become an author, or do you have a specific reason or reasons for writing each book? I have always had a love of writing , but of verses and would write verses about all kinds of things, Love, Life, Friendship and aspects of the world, mainly in English and one or two (Aran Related) in Irish. This however is my first Story. I love reading and I use it as an escape from the “real world”. I love Cathy Kelly , Marian Keys and Claudia Carroll. I did read 50 Shades of Grey , I admire EL James , the book may not be everyone’s cup of tea.. but she took a chance and has sold 70 million copies worldwide. If that is not success, then nothing is. Tell us some more about your book. My Book is call “Fate, Hope & Love” it is based in Galway city and the Aran Islands. It is a modern day fiction, romantic story that follows life , love and everything in between. My main character is a single girl called Jessica, She works and lives in Galway City but is originally from Kilronan in the Aran Islands. Jessica has been hurt in a previous relationship and is slow to trust anyone again. The book follows her story where she meets Sam Casey a stranger who’s act of kindness , might just be the start of happiness for Jessica. Who do you see playing the lead character from your most recent book? I write as relaxation, I work in the Emergency Services and I have a young family , so reading and writing are my “down time”. I get inspiration from lots of places in life , of course the people who surround me , from situations and everyday living. I also get inspiration from the beautiful country we live in and love photography. I also am a hopeless romantic and love music… so my inspiration is a combination of everything put together. I have a quirky sense of humour.. I don’t take myself too serious and know for a fact that I am clumsy , quite self critical but with a heart as big as anything, so I write from my own experiences too. I think it comes across as light hearted, and quirky .. like me I guess. 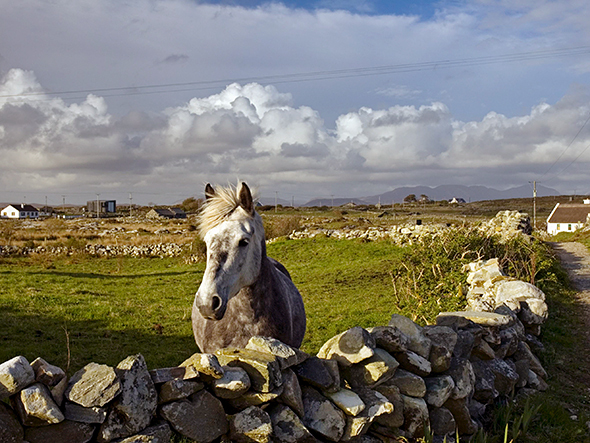 What is your favourite place on the Aran Islands? It would really be impossible to pick one – But if you really force me – I will narrow it down to two. If you had to find me in Aran, you would find me either sitting on the wall overlooking the pier in Kilronan , watching life go by or I will be at the top of Dun Aengus, crawling as close to the edge without falling over !.. camera in my hand and wonder at the utter beauty of the place in my mind. Why did you go to the Aran Islands in the first place? 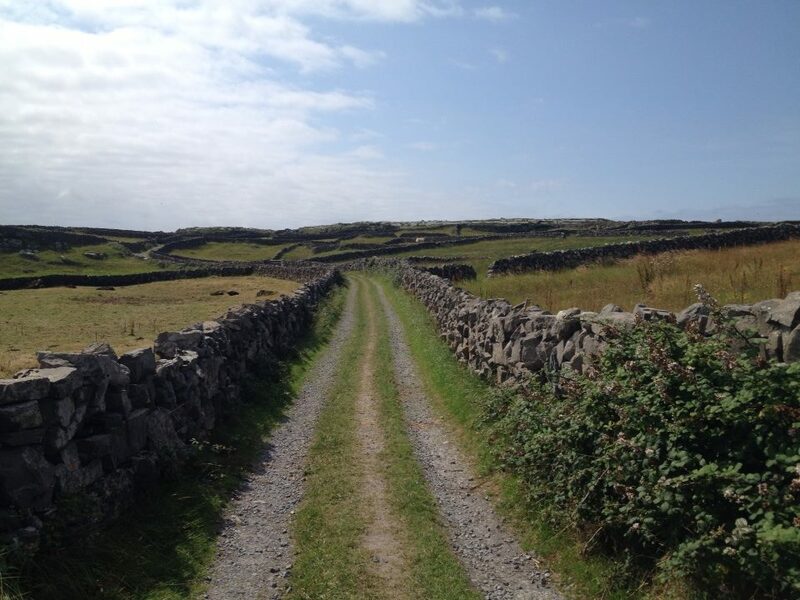 My first ever trip to the Aran Islands was on a school tour , I went back after that to find summer work in a Bed and Breakfast. While I physically left to work in Galway .. my heart never did. join in the celebrations on this day. came to be one of the most celebrated Saint’s in the world? Kilpatrick in Scotland in approx. 387 AD. Celtic Druids and began to convert these people to Catholics. begging him to return to Ireland. Catholic Church and returned to Ireland to start a Church here. am very glad of this . as a symbol of good luck and is worn pinned to clothes on St.
is the colour now associated with all things Irish. don’t let him go and oh yeah, give me a call. !! to remember the Saint. Wear Green. Pin Shamrock on you. in many many countries worldwide. Listen to and enjoy some traditional music, dance if you can. Just celebrate being Irish or just being with the Irish. what time and be sure to join it. St.Patrick’s Day on the Aran Islands. There will be lots of great events on the Aran Islands on St.
on the intimate setting of the Aran island of Inis Mor. need to know about the weekend. Who knows , I might just see you there ….! An innkeeper, a painter, a bodhran maker. Almost 30 years ago on a chilly June night I stumbled into Ballinalacken Castle House Hotel in County Clare and came upon a gruff lion of a man with an unruly mop of hair who offered me a country welcome amid peat fires, heavy blankets, and flowing pints of Guinness. Denis O’Callaghan has endured my comings and goings at all hours, my crashing into his car, my insistent requests for more of his wife Mary’s unmatchable soda bread, nearly every year since. He has become as much a part of my visits to the west of Ireland as the nearby Cliffs of Moher, the traditional Irish music played in McDermott’s Pub just down the hill in Doolin, or my wind-whipped hikes across the Burren. His site on a bluff overlooking the sea and the Aran Islandsbeyond is a place I return to in my mind on a weekly basis. 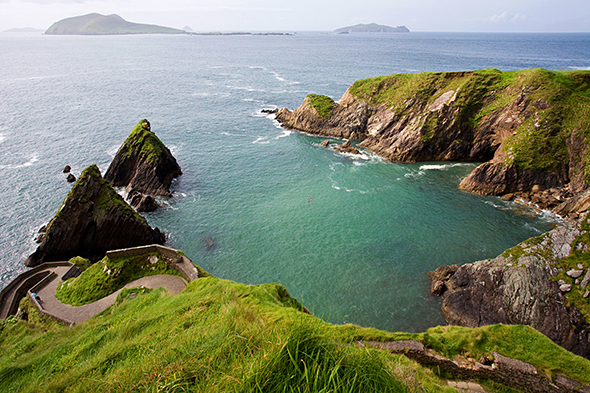 A large canvas covered by a roiling blue-green sea led me to find Carol Cronin halfway out on the Dingle peninsula, a craggy finger of unmanicured land jutting out into the Atlantic in County Kerry. Carol’s gallery on Green Street in the town of Dingle is filled with a riot of seascapes—gray, golden, turquoise; some placid, some in turmoil. She can be found there painting—usually barefoot, long brown hair yanked back off her face—on most afternoons. It’s Carol who pointed me to Curran’s, a Main Street pub where the owner/barkeep shared with me crumbling letters of gratitude sent to his grandfather by so many of the people who had fled Ireland during the Great Famine with a few pounds of the elder Curran’s money in their pockets to ease the way. It was Carol, too, who insisted I go out to the Blasket Islands, the now deserted, treeless outcrops that were home to a few dozen rugged, Irish-speaking people until the mid-20th century. Alone on Great Blasket, amid the handful of derelict houses, under raging wind then lashing rain then burning sun, I spent a day in potent silence that I have never forgotten. It explains why Ireland’s premier bodhran maker has secluded himself far from the beaten path in County Galway, and why musicians make the pilgrimage to his seaside studio for his custom-made drums. For more than a quarter of a century I’ve traveled this coast, up from the filigreed fringe of west Cork, along the lakes of Killarney, to the world-class golf links of Ballybunion and Lahinch, to Yeats country in Sligo, meeting people like Denis, Carol, and Malachy. Next year, I’ll meet still more. Celebrated travel writer, actor, and director Andrew McCarthy is an editor at large at National Geographic Traveler magazine. Follow him on Twitter @AndrewTMcCarthy. A mystery on the Aran Islands off the Irish West Coast has finally been solved by one of the world’s top geologists. Something had picked up massive boulders off a beach and propelled them over high cliffs to a flat landscape beyond. The largest of these boulders weighed about 78 tons, and they now lie some 40 feet above the Atlantic Ocean. Smaller boulders, weighing about 4 tons each, lie more than 820 feet inland. “The local people say that these rocks are moving,” said geologist Ronadh Cox, a professor of geosciences and chairwoman of the maritime studies program at Williams College in Massachusetts. The mystery of how they got there has finally been solved. The most likely culprit, a tsunami hasn’t hit Ireland since 1755, when a magnitude 8.7 earthquake in Portugal sent tidal waves across the ocean to Ireland. By dating the rocks they proved that some arrived on land thrown up from the ocean 2,000 years ago, but others arrived less than 50 years ago,a key piece of evidence that leaves powerful storm waves holding the smoking gun, Cox said. She said the mystery was solved and the ocean’s power is truly astonishing “The waves can just climb these cliffs in amazing ways,” she said. The team at aranislands.ie accept blogs from guest bloggers who have an interest in the Aran Islands or the region in general. As one of the leading tourism websites in the West of Ireland, our blog has an established fanbase. We accept blog posts that have previously published as well as new unique blog posts. Just email us at info@aranislands.ie and we will take it from there.